When we go out for breakfast (which we don’t do very often), I love getting a Denver Omelet. There’s just something about the combination of eggs, ham, cheese and bell peppers. It also makes a very substantial meal that will keep you going. I recently started making it at home and thought I’d share the recipe with you today. We have this for breakfast every once in a while, but more often, I’ll make it for dinner along with a green salad. Quick, inexpensive and pretty healthy. What more can you ask for? If you’re trying to stay away from meat, substitute a few sauteed mushrooms for the ham. Quick Tip: I use the last few slices of Holiday ham for this. I cut them up into small cubes and throw them into small freezer bags. You don’t need much for each omelet. I just grab it straight from the freezer and saute it with the peppers and onion. By the time the veggies are tender, the meat is defrosted and warmed through. Cook the ham and veggies in a little butter until they are tender. Season with salt and pepper to taste. Whisk the eggs together and pour them into a medium sized non-stick skillet over medium heat. If you’re worried about the omelet sticking, spray it with a little non-stick spray first. Move the egg mixture around for the first 30 seconds or so. When the egg starts to set, swirl it around and make sure the entire bottom of your pan is covered. 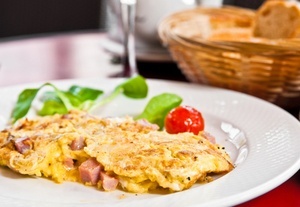 Add the cooked (and warm) vegetable ham mixture to the center of your omelet. Add the shredded cheese and continue cooking the omelet. When it’s mostly set, fold it in half and slide it on a plate. The remaining heat will finish cooking the egg. Tip: If the omelet ends up not being cooked well enough for you, stick it in the microwave in 20 second intervals until it’s done to your liking.